The photo above is reproduced with the permission of Colin Leonhardt, owner and operator of Birdseye View Photography, a helicopter-based aerial photography service in Perth, Australia. 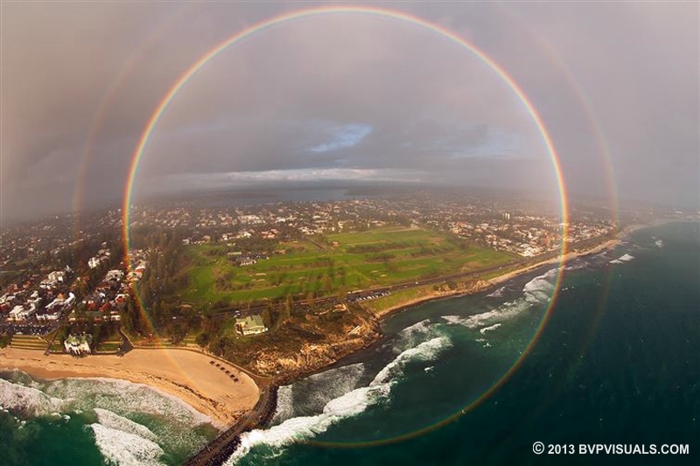 This is the best photo I’ve ever seen of a full 360° rainbow. If you’d like a larger high-resolution print, you can order one from his website. Here’s the EXIF data: Canon EOS 1D Mark II N + Canon 8-15mm fisheye @ about 12mm, ISO 160, 1/250, f5.6. In addition to the full 360° primary bow (more about that later), the photo also shows a distinct secondary bow outside the primary with the color sequence reversed (as always). Finally, it shows the usual brightening of the sky inside the primary, caused by sunlight being back-scattered from other raindrops. I’ve done several posts about rainbows here at Sky Lights. My best double rainbow photo was in my March 5, 2012 post, but it only shows about 150° of the bow. What I want to focus on in this post is the 360° circularity visible in Leonhardt’s photo. Most rainbows show at most 180° of the full circle. That’s what makes Leonhardt’s photo so remarkable. In fact, it was the September 30, 2014 Astronomy Picture of the Day (APOD). There’s a great page on HyperPhysics if you want more technical details. But let’s try to keep this simple. 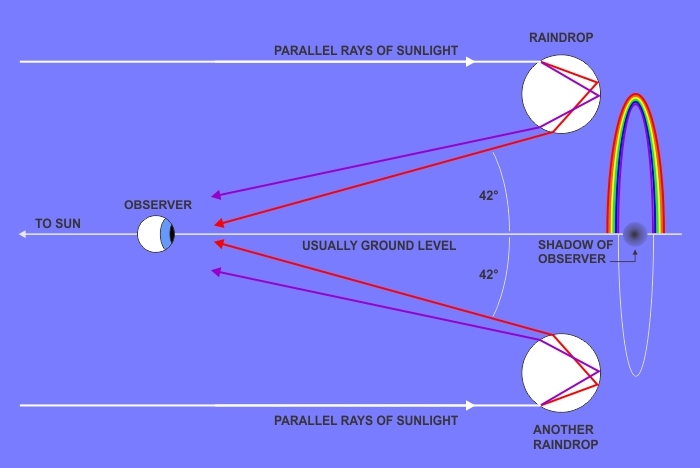 What it comes down to is the angle defined as: ∠Sun→water droplets→observer. For the primary rainbow, that angle is 42°. For the secondary bow it’s 51°. Those numbers come from the physics of how light bounces around inside a raindrop and gets sent back to your eyes. The graphic below shows a simplified version of what’s happening, using only the primary bow. Also, rather than showing all the colored rays, I’ve limited it to the red rays (which form the outer edge of the rainbow) and the violet rays (which form the inner edge). The violet light changes direction more than the red light because of its shorter wavelength. That’s the law of refraction. All the other colors take intermediate paths. When you see a rainbow, the Sun is always behind you. The rain is in front of you (or on you). The shadow of your head is at the center point of the rainbow (good photo of that on the HyperPhysics page). There’s millions of raindrops available to contribute their light to the rainbow. The graphic shows only two drops, the lower of which is usually blocked by the ground. However, any drop 42° from your line of sight (around an 84° diameter circle) has the potential to participate. Problem is, when you see a rainbow, you’re usually standing on the ground. That eliminates half the circular bow, so you see (at most) the 180° bow shown in the above graphic. But if you’re standing on a mountain top, or in an aircraft, in which case raindrops below the horizontal can participate, you’ll witness a full 360° bow. Of course, the mountain’s shadow can get in the way depending on the exact position of the Sun. The view from an aircraft is always better. I enlarged Leonhardt’s photo and looked for the shadow of his helicopter at the center point of that rainbow. It should be visible, but depends on altitude, background, and camera settings. I couldn’t see it, but here’s some examples. In fact, the exact center point of the bow will be located at the position of the aircraft window through which the photo was taken. There’s an interesting consequence of this geometry. If you and a friend are enjoying a rainbow, standing side by side, you’re both seeing a “different” rainbow created by different light rays from different raindrops. Both rainbows will appear identical, but every rainbow seen is unique to its individual observer. And that raises the question: If the conditions for a rainbow are present, but nobody is looking, is the rainbow still there?